Foam ear pads. Easily replaceable, liver beard for both large and small models of headphones. The pads are mounted by means of a glue. Foam ear pads available for large and small models of headphones. Each set of two pieces. This case is designed to protect your Clear Signal headphone from damageing. The earcups fold exactly in the molded compartment. The coiled cord has space making it protected against twisting and breaking. Available for all models Clear Signal headphones. 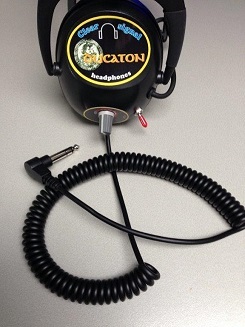 The curly cord has a compact inner core and is equipped with an 90° degree angled waterproof 6.35mm stereo jack. The outer shell of the spiral cable is made of PUR.